The following technical post tours below are provided by travel and tourism operators in Nakhon Phanom for registered MTF 2018 delegates only. More tours will be added over the coming days. Scroll all the way down to register for a tour. Important: By registering for a post tour, you waive any liability of accidents. You are responsible to get to the indicated pick-up locations on time. Any tour is between the host and the delegate; MTCO only facilitates the registration process. Any payment is to be made directly with the operator. These tours are provided by the operators free of charge, or at a significant discount, in order to showcase tourism experiences in Nakhon Phanom and Northeastern Thailand in Isaan Region to delegates of MTF 2018. Please bring your MTF 2018 name badge to your tour. Nakhon Phanom is in the northeastern region of Thailand, approximately 734 km northeast of Bangkok and 378 km southwest of Hanoi, Vietnam. It borders Laos on the Khamoun Province or the Tha Khaek district. The population of Nakhon Phanom is a diverse mix of Thais, Thai-Vietnamese, Thai-Chinese, and perhaps a few Thai-Indians. The main languages spoken are Thai, Isaan, and Vietnamese, Isaan being the most popular of them. The primary culture is Lao, as Isaan was part of Laos until the late 19th century. First starts to visit Wat Maha That. Wat Maha That is one of the sacred stupa for those who born on Saturday. It holds a believe that whoever who comes to make worship will gain merit and charisma as well as have a good destiny for the entire life. Visiting the former governor’ house which is at the moment a museum, builded in old colonial western architecture style. Visiting St.Anna’Church Nong Saeng which is considered to be an outstanding for its timeless beautiful architecture in Nakhon Phanom. The building is distinctive for its gothic style of architecture. 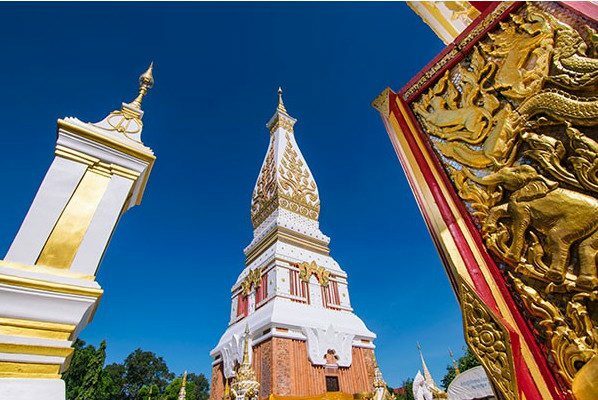 The most important Buddhist site in the province, Phra That Phanom features a 53-meter-tall, square-shaped pagoda, which is a Laotian-influenced shape of numerous pagodas found around the area. It is believed that Phra That Phanom was originally built before the 12th Buddhist century, but it entirely collapsed on August 11, 1975 after several days of rainstorm. The current pagoda was later build according to the former design by local donations. Shine underneath the sun atop the pagoda is a 110-kilogram solid gold spire. 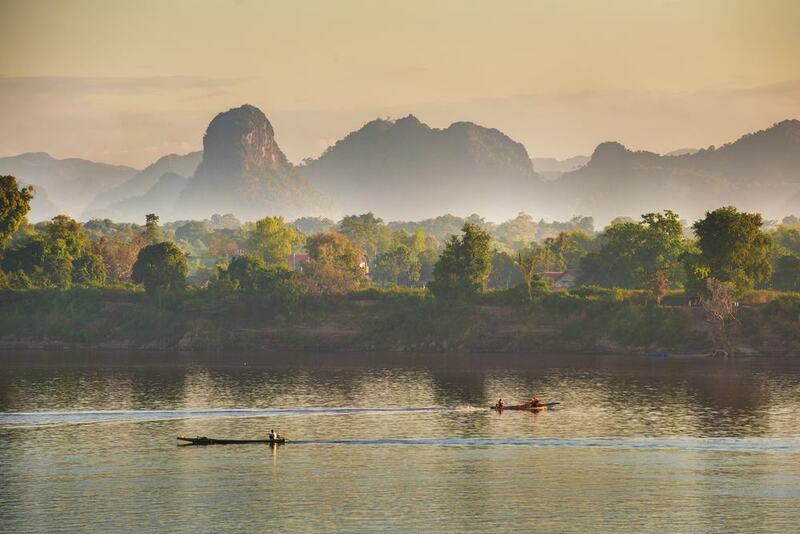 Nakhon Phanom is situated along the Mekong River which is the only province in Thailand where you can ride a bicycle along the Mekong River with the distance of 74 km. 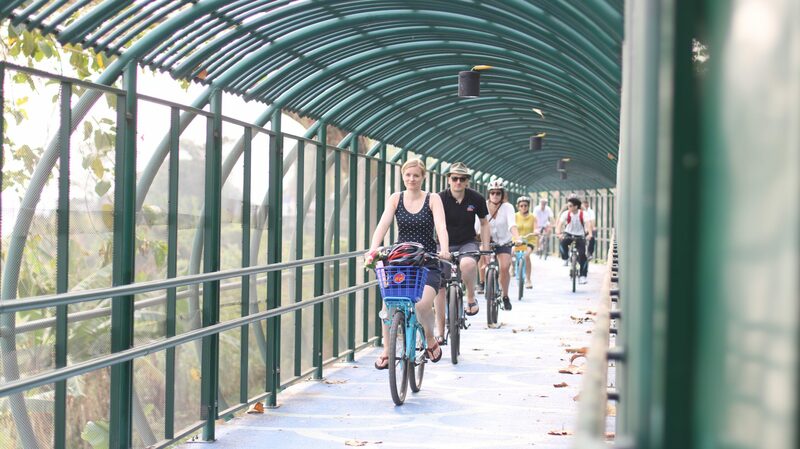 You can enjoy riding a bicycle with the most beautiful scenery of Mekong River. Started on Soonthorn Wijit Road in front of Wat Phra In Plaeng then cycling along the bike trail along the Mekong river through various attractions. Thai-Vietnamese Village (Ban Na Chok village) is the place where Vietnamese communist leader Ho Chi Minh had resided for 7 years and used this place as the center of Vietnam’s liberalization from France during 1924 – 1931. 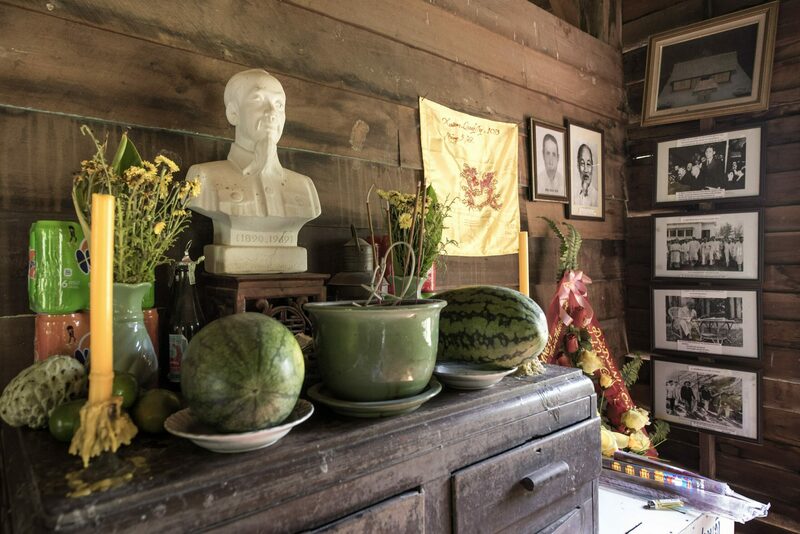 Nowadays, Uncle Ho’s house becomes a museum and a place to display the biography of Ho Chi Minh. On this post-forum tour, Ministry of Tourism and Sports, Nakhon Phanom Province will transfer participants to the village by local transport called “Skylab” (3 Wheels motorbike). There will be a short tour of the village including visiting local community as well as experiencing Vietnamese tea and snacks. The Songkram River is a large tributary of the Mekong River which runs through the northern part of northeast Thailand. Taking a long-tail boat tour of local fishermen and learn about fishing equipment in Pakyam village and then visit Tarbor village which is well-known in this area for fishing and pickled fish. On this post-forum tour, Ministry of Tourism and Sports, Nakhon Phanom Province will transfer participants to the village. There will be a short tour of the village including visiting local community as well as experiencing local fish dishes and OTOP products. SunTree Art & Culture Organic Market is a brand new tourist attraction which will be officially launched in September 2018. 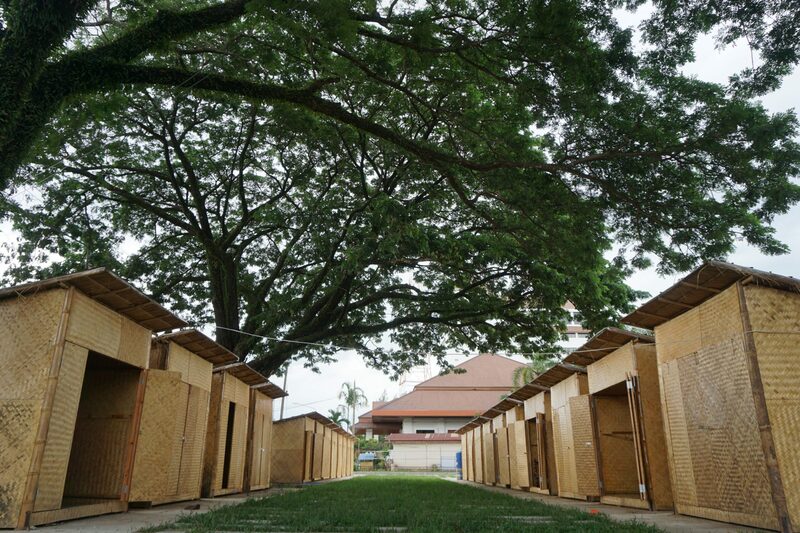 The concept of establishing a market is to be “Happy Center” and the beginning of travel journey in Nakhon Phanom. Standing on the banks of Mekong River including 9 beautiful “Jamjuree tree (Rain tree)” which is become the name of Suntree (Soontree). On this post-forum tour, you can enjoy a half-day tour and learn about the philosophy of Sufficiency Economy, a story of organic farming and herbs and experience a cooking class, desserts and local beverages. There will also be a bamboo or banana leaf workshop facilitated by local people and enjoy canoeing to explore Mekhong River in Nakhon Phanom.